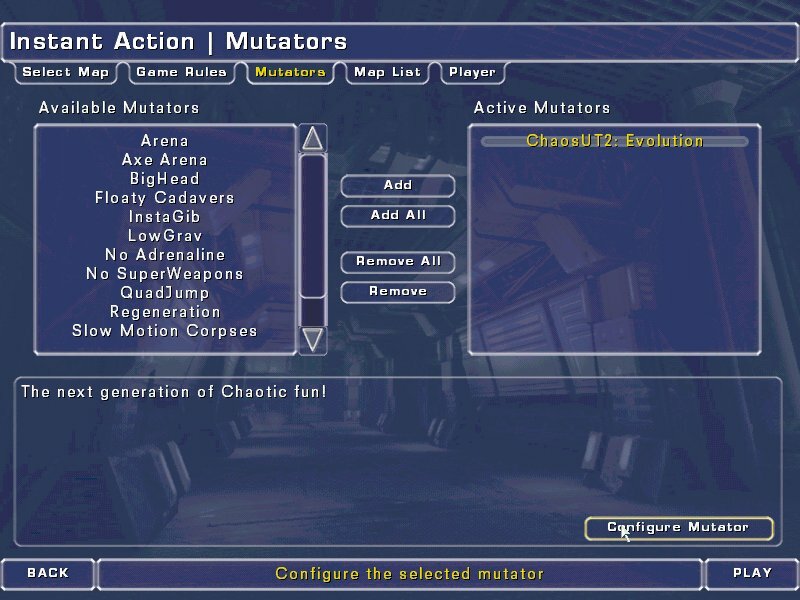 ChaosUT2 can be played in any standard gametype, simply by using the ChaosUT2: Evolution mutator. This will allow you to use the Chaos weapons and items on ANY STANDARD UT2 MAP, and ANY UT2 GAMETYPE. This one mutator will cause certain weapons to rotate between standard UT2 weapons, and the new ChaosUT2 weapons, every 30 seconds or so. It will also enable the various other features of ChaosUT2. This is the main mutator for playing Chaos, and is the only one needed for a standard game. 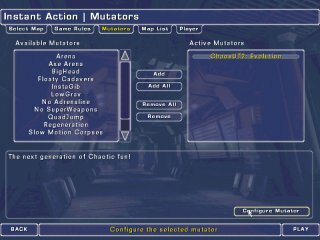 Note: When you click on the ChaosUT2: Evolution mutator, a new ‘Configure Mutator’ button will appear on bottom right of screen. Clicking on this will open the ChaosUT2 menus. Starting a game with the Chaos game types works exactly the same as the standard UT2 game types. 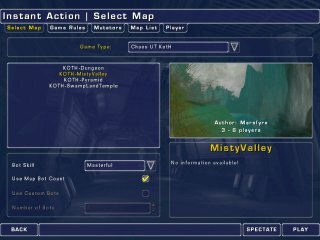 Then select any of the Chaos game types from the Game Type drop down menu, just as you would for the standard UT2 game types. All the maps in your maps folder matching your choice of game type will then automatically be displayed in the windows below (both Chaos and non-Chaos maps will be listed). Select the map you wish to start with, and then proceed to the Game Rules tab.